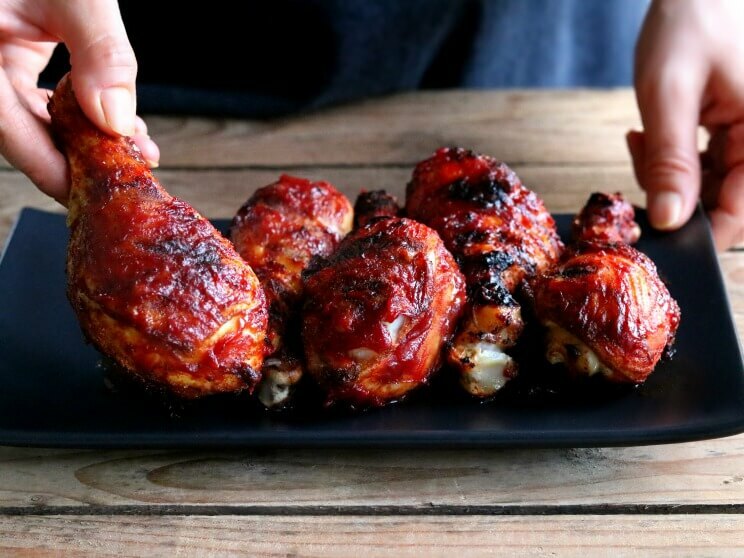 Fire up your grill and bite into these glazed chicken legs slathered in a smoky-sweet maple sauce. 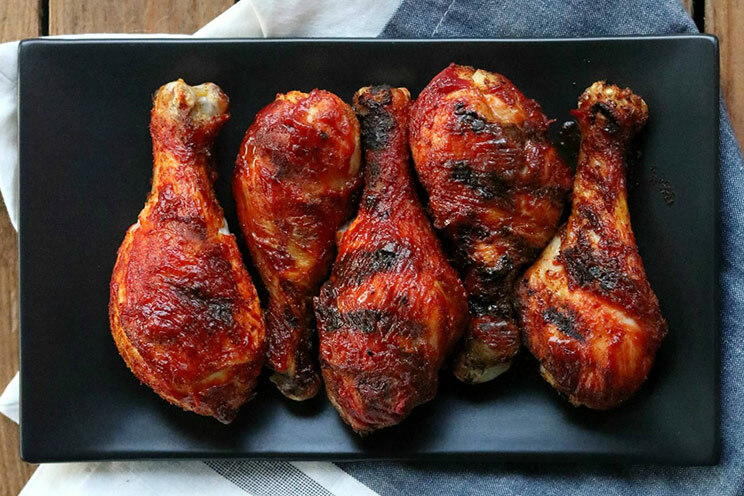 Chicken legs have a unique mixture of dark and light meat that creates a juicy flavor that can handle the high heat of the grill without drying out. While most barbecue sauces are full of sugar, this homemade recipe uses a smoky dry rub followed by a light maple syrup glaze for a heavenly sweet and smoky flavor. Ground turmeric, cumin and smoked paprika are all you need to create the dry rub. Turmeric adds an exotic kick and packs natural anti-inflammatory properties; add a dash of black pepper to help increase the bioavailability turmeric. Cumin brings an earthy and warm aroma to the dry rub, while smoked paprika adds the signature smoky flavor to the glazed chicken legs. This is a great herb to have on hand, especially in the cooler months when grilling indoors to achieve a smoked flavor. If you want to make the rub spicy, stir in ¼ teaspoon of chipotle powder or ground cayenne pepper. Start by preheating the grill to at least 350°F over direct heat. Blot any excess moisture off chicken legs using a paper towel. Using a mixing bowl, sprinkle the rub over chicken legs and use hands to coat them in the rub. Place legs onto grill and cook 10 minutes. Cooking for a short time before basting allows the rub to create a coating on the legs and crisp the skin. In the meantime, stir together maple syrup and tomato paste to form a thick glaze. Turn chicken over and use a basting brush to brush chicken legs with the glaze. Continue grilling 10 minutes and flip one more time, repeating glazing and cooking 10 minutes longer. If using a meat thermometer, cook until internal temperature reaches 185-190 degrees. Fire up your grill and bite into these chicken legs slathered in a smoky-sweet maple glaze. Preheat grill to 350°F over direct heat. While grill heats, mix dry seasonings and sprinkle over chicken legs in a large mixing bowl. Use hands to rub seasonings into chicken and evenly coat. Place chicken legs on grill and close lid. Grill 10 minutes. Stir together tomato paste and maple syrup while chicken is grilling. After 10 minutes, turn chicken legs over and baste with maple tomato glaze. Grill 10 more minutes, turn again and baste the opposite side with glaze. Grill 10 minutes longer (total of 30 minutes). Serve hot.